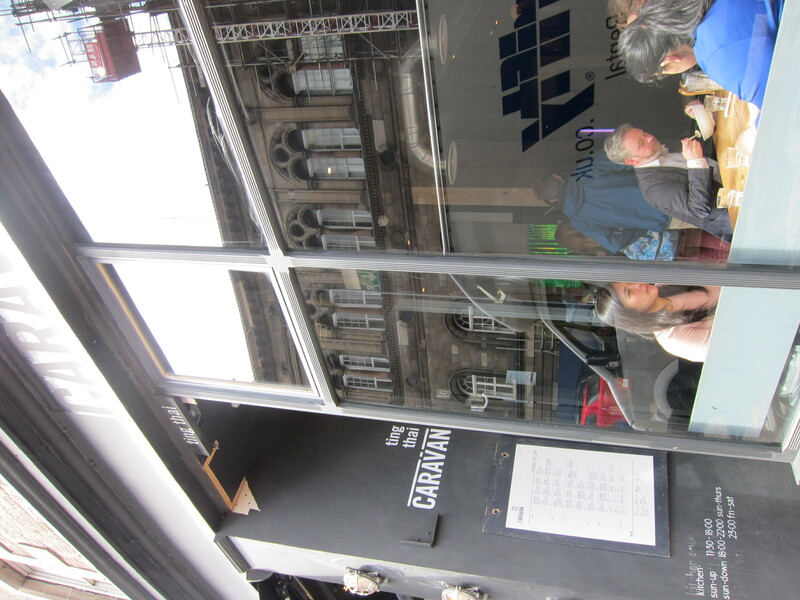 Like many restaurants with solid chops these days, Ting Thai Caravan began as a popup. After gaining a following during the Edinburgh Fringe Festival, it opened a permanent place in 2013 — one that’s doing rather well, judging from how crowded it looks each time I’ve passed by. 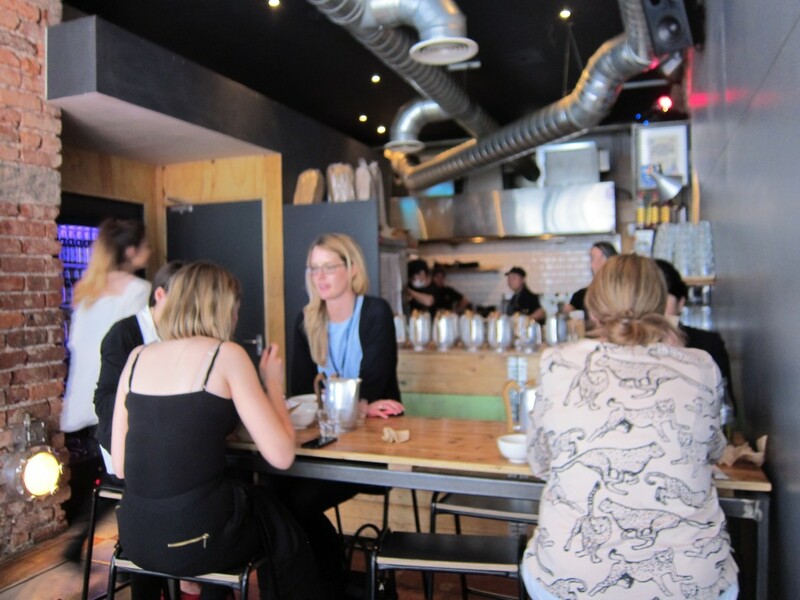 The decor is basic industrial chic, with communal tables and bar stools. And the menu is packed with some of the usuals — pad thai (£5.80) and green curry (£5.60) — along with entrees like pan-fried seabass (£7.20) and a whole section of “small box” tapas-style appetizers ranging from cured pork sticky rice balls (£3.30) to “son-in-law” fried eggs topped with crispy shallots and chilli jam (£3.30). My Scottish friend Robert had picked the place because he doesn’t eat Asian food very much but had been curious about the restaurant. And he thought it might be fun to see how an Asian food aficionado might find it. 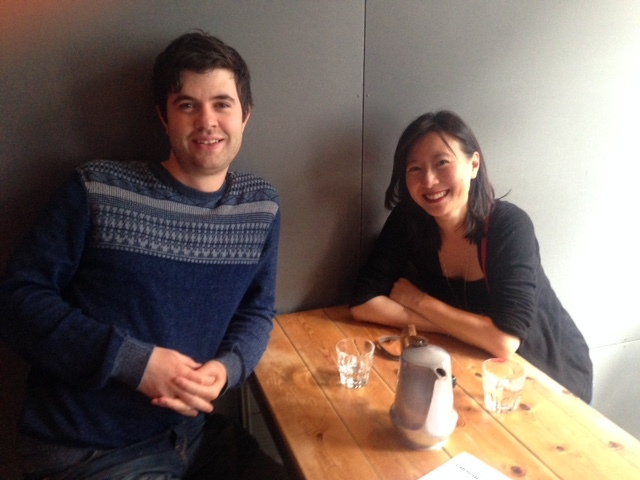 Once we sat down, we determined one thing: we both wanted to eat everything on the menu. Seeing how that wasn’t possible, we settled on a few things. First up, the goong froong beer (£3.60) small box — fried “bubble prawns” with grated coconut beer batter, mango salsa and sweet potato crisps. I had been wondering why it was called a small box dish but when it arrived, that was explained away. 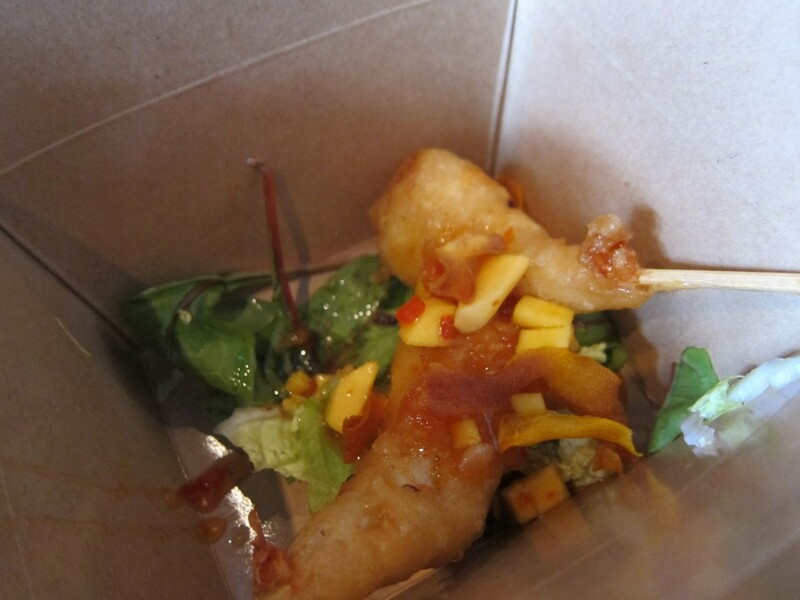 These dishes actually come in a small takeaway box. Robert was so hungry he grabbed a prawn even before I could get my camera out — he was the smart one though. You really want to eat these hot and right away — the puffy crunch was terrific and the mango salsa and salad bits beneath it were a lovely tart foil to the sweet, meaty king prawns. 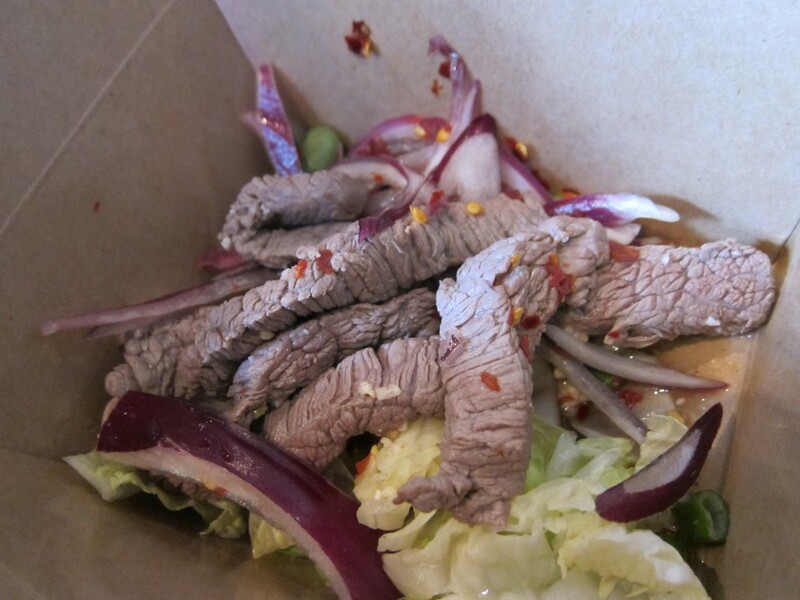 The nam tok nua small box (£4.20), spicy beef salad with roasted rice, red onion, mint, Thai parsley, chilli and spring onion, didn’t disappoint either. Don’t be afraid of all the chilli seeds and flakes you see — it’s really not that spicy. The beef was a little tough and probably would have worked better in smaller chunks but as a whole, the flavors in this tossed salad were nicely done. 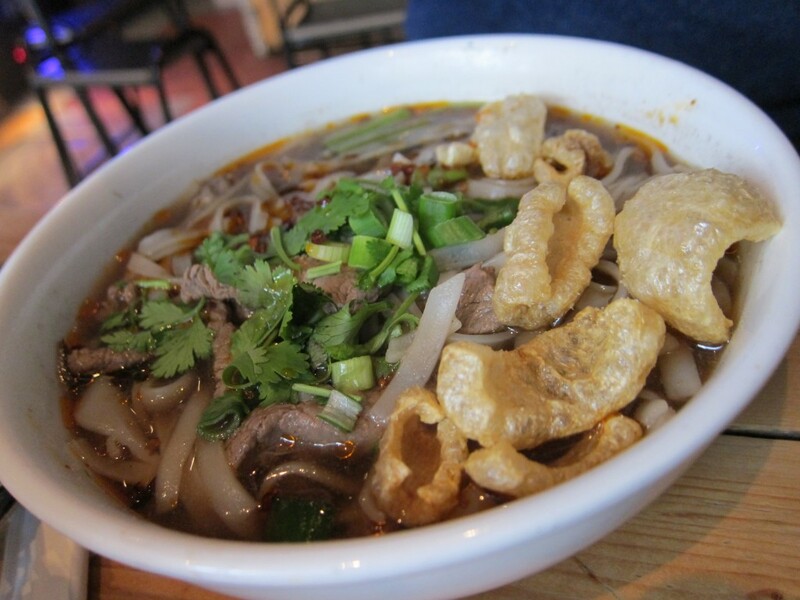 Robert and I had both been eyeing the kuay tiaw nam tak nua (£5.60) — a bowl of noodle soup with beef, Thai parsley, Thai basil, morning glory, chilli, garlic oil and crispy pork skins. He took the plunge and from how quickly he emptied the bowl — seriously, he left not a drop — I’d say it was a winner. I only tasted the broth in this dish — which was a knock-out that was just packed with flavor. I loved how aromatic it was, a heady mix of tangy spices and meaty oomph. I would have had major food envy had my own dish not been terrific. 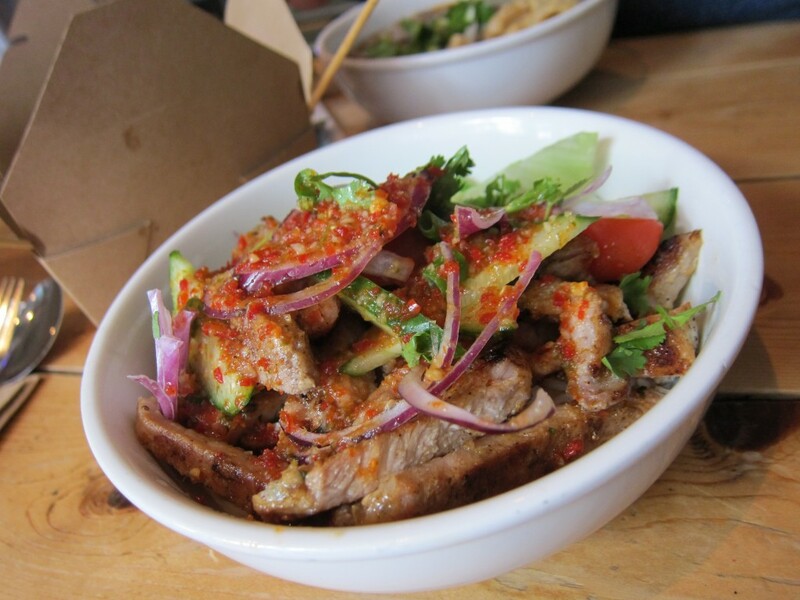 The yam moo yang (£5.80) — grilled marinated pork topped with garlic, lemon, coriander, chilli, fish sauce, cucumber, tomato and shallots on a bed of jasmine rice — was awfully good. The strips of meat were very nicely marinated and grilled but the toppings really made the dish. Each bite of pork coated with chilli etc was especially tasty chased with a crisp, cool sliver of shallot or cucumber. Meeting Robert was a total treat because I almost never get to meet the photographers who shoot my travel pieces. Having met him now though — especially after that delicious meal we had — I’m now thinking I need to make this more of a habit. 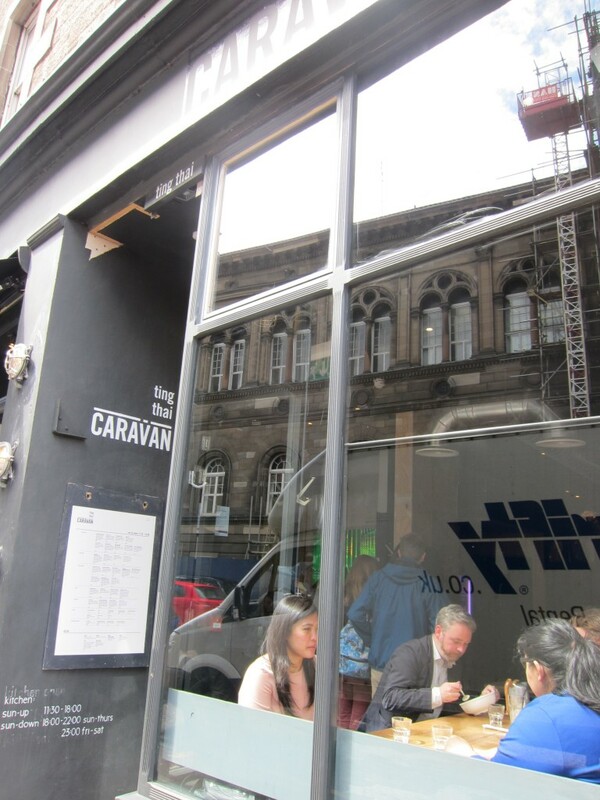 Ting Thai Caravan, 8–9 Teviot Place, Edinburgh; +44.0131.225.9801.